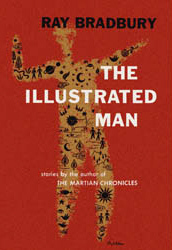 The Illustrated Man: Chapter Ten - The Exiles - Jimmie Aaron Kepler, Ed.D. Numerous works of literature are banned and burned on Earth. The fictional characters of these books are portrayed as real-life entities who live in a refuge on Mars. However, they are vulnerable, as when all the books on a character are destroyed, the character itself vanishes permanently. When the group of characters learn that some people are coming for them, they stage a counterattack, but are foiled by the astronauts who burn the last remaining books from Earth, unknowingly annihilating the entire colony.